Dubai (is an emirate in the United Arab Emirates (UAE). A city within the emirate is also named Dubai. The emirate is located south of the Persian Gulf on the Arabian Peninsula and has the largest population with the second-largest land territory by area of all the emirates, after Abu Dhabi. Dubai and Abu Dhabi are the only two emirates to have veto power over critical matters of national importance in the country's legislature. Dubai City is located on the emirate's northern coastline. 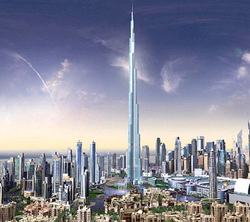 Today, Dubai City has emerged as a global city and a business hub.Although Dubai's economy was built on the oil industry, the emirate's model of business drives its economy, with the effect that its main revenues are now from tourism, real estate, and financial services, similar to that of Western countries. Dubai has recently attracted world attention through many innovative large construction projects and sports events. This increased attention has highlighted labour rights and human rights issues concerning its largely South Asian workforce. Almost half the population of Dubai comprises Indians. Dubai's property market experienced a major deterioration in 2008 and 2009 as a result of the worldwide economic downturn following the financial crisis of 2007–2010.